For people who are livin' la vida low-carb and love chocolate milk (LIKE ME! ), there is one and ONLY one brand of low-carb chocolate milk that beats all the rest by a mile -- Carb Countdown from Hood. This stuff is amazingly good and tastes so rich and creamy you'll never know you're drinking a "diet" product! But, as we have seen with other companies who have scrubbed anything having to do with low-carb from their product names, Hood has decided to change the name of their Carb Countdown milk to Calorie Countdown instead. This is the EXACT same product made with the EXACT same ingredients and contain the EXACT same number of calories, carbs, sugar and fat as the Carb Countdown product did. But we can't offend any of our customers by having that awful "Carb" word on our products anymore now can we, Hood obviously thinks! It is funny how the Calorie Countdown packaging is almost an exact duplicate of the Carb Countdown packaging, including the font and size of the name of the product as well as the notation of "84% fewer carbs" (that's funny, the Carb Countdown only had 80% less carbs!) and "90% less sugar." The only other difference is they point out it has "60% fewer calories." Many of you had complained that your local supermarket and food stores pulled Hood Carb Countdown from their shelf. Well, now this may explain why they did and will, perhaps, now bring back the new packaging since anything that deals with calories MUST be good (HA!--why else would these ridiculous 100-calorie food products be such a hit with consumers?!). Before Atkins Nutritionals, Inc. ran into financial problems with their bankruptcy last August, their famous logo was placed on a number of products on supermarket shelves as "Atkins-friendly" foods to eat, including the Hood Carb Countdown milk. That was one of the reasons I decided to start drinking that name-brand of milk since regular milk was much too high in carbs for me during my weight loss phase. 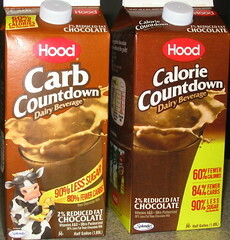 When I was in the midst of losing 180 pounds in 2004, Hood Carb Countdown chocolate milk was a real lifesaver for me. As long as I could drink a glass of this thick, rich stuff, I never felt deprived of something I enjoyed so much as a kid and into my adult life. I'm glad they have decided to keep this product alive because it really is fantastic and good for you compared to the high-sugar alternatives. I just wonder how many new people to livin' la vida low-carb will know Calorie Countdown milk is acceptable for them to use. As I alluded to in my book "Livin' La Vida Low-Carb," the more "low-carb" products go away or change their name, the wiser you must become as a food shopper. Always read your labels whether the food claims to be low-carb or not and YOU ultimately decide whether it fits in your new lifestyle or not. You're a smart cookie (sugar-free, of course!) and can make prudent choices on your own about what to buy. Don't be afraid to check the nutritional facts on EVERYTHING you purchase because it could save a lot of headaches down the road for you. Word to the wise. However, speaking of Hood products, one of the casualties of the move away from low-carb was their Carb Countdown juices that had 75% less carbs and 90% less sugar than regular orange juice. I tried these juices myself, but I didn't like them too much because I'm just not a juice kinda guy. But one of my blog readers was an enthusiastic lover of the Hood Carb Countdown juices and is now "VERY, VERY, VERY disappointed" they are no longer available. "[The Carb Countdown juices] were a staple every morning for me, I even kept about four 1/2 gallons in the fridge at all times just so I wouldn't run out." That sounds like someone who really likes juice and was smart enough to buy something that wouldn't cause his blood sugar to spike like the sugar-loaded regular fruit juices would cause (The Hood fruit juice was sweetened with Splenda and ACE-K). But now he's desperate for another low-carb alternative juice. "Has anyone heard of a comparable low-carb breakfast juice? Juice is a very important part of any diet because it's so rich in vitamin C -- but it has to be low carb juice made with Splenda because you're 100% correct about the standard fare which is loaded with sugar and just one small glassful will throw you right out of livin' la vida low-carb." "Actually, it really ticks me off to see the supermarket loaded up with 5,000 different varieties of juice and us low-carbers cannot even have a thimbleful of any of 'em because NONE of 'em are low-carb." What imagery! The frustration for low-carbers continues in 2006 as we are a large market waiting for companies to step up to the plate offering us what we want and need for our healthy way of eating. If Hood has abandoned us by the removal of their low-carb fruit juices and there are no other alternatives available for people on low-carb, then where is the entrepreneurial spirit of a company in the United States of America to fill this void in the marketplace? Is there not even ONE company brave enough to pick up where Hood left off and give us low-carbers a choice in this? Surely there is a company or two who could make and market a very low-sugar, low-carb fruit juice that diabetics and low-carbers alike can use as part of their healthy lifestyle change. You don't even have to call it "carb" anything, but let us know on the packaging that it is "low-sugar" or contains "less carbs" so we will at least take a look at your product. Regular OJ has an unbelievable 30g sugar carbs in every 8-ounce glass and, as my reader noted, that's WAY too much for us which necessitates us looking for alternatives. If you would like to contact Hood regarding their name change on their low-carb milk products and/or their decision to stop making their low-carb fruit juices, then use this contact page to make your voice heard. Maybe they think the millions of us low-carbers have gone back to counting calories again to manage our weight and health. NOT! It appears Hood is putting some marketing dollars behind promoting this "new" product to the public and they are even highlighting that it has "fewer carbs." So why couldn't they do this when they had Carb Countdown milk, hmmm? It's about as disgusting as the Coca-Cola company pushing Coke Zero heavily with advertising dollars while they completely ignored their similar product Diet Coke with Splenda. Will they repackage Diet Coke with Splenda into Razmatazz Diet Coke and keep the same ingredients, except this time support it with adequate marketing? You know, some of these companies just don't have a lick of common sense sometimes, IMHO! I liked the milk, but never cared for the juices. And I can't get the milk where I live so I have to make do with soy milk. Crystal Light makes a sunrise orange and a ruby red grapefruit that I use for my morning juice. Ditto on the crystal light. I use them as well and I think they taste great! I picked up my Carb Countdown today and got one of those check-out generated coupons for "Calorie Countdown." At least they are still going to make it. We never did have the juices here. But I will have to give the crystal light a try - I like their flavored teas. Trust me, Leigh. The juice was NOTHING like regular juice. It had more in common with crystal light than juice. After the first time, I never bought it again. What was in the juice? I never saw the juice in the stores, but the picture on Jimmy's blog indicates that it must have had at least some real orange juice in it, since they can't call it a "juice beverage" if it doesn't have real juice in it, and it still had some sugars and carbs in it. For those who want to try to duplicate the juice, why not figure out how many carbs you would have gotten from the Hood product, and proportionately mix real orange juice with orange flavored crystal light or other artificially sweetened orange drink. Or better yet, mix the juice with water, splenda and/or stevia and orange extract and/or orange oil to make a similar (and quite possibly better tasting) product? Maybe I'm missing something vital here though, so feel free to correct me if I'm just misinformed about what was in it. Crystal Lite Sunrise, or Koolaid Sugar free. Great stuff! I am SOOO glad to hear Hood Milk is still around! Unfortunately they did discontinue carrying it at my local grocery, tho. Diet Ocean Spray is fairly low in carbs. My wife likes the orange. To me, the orange doesn't really taste like orange juice. But, we both love their diet cranberry juice which has only 3 carbs per 8 oz. serving. Add a little Vodka, and you have a nice cocktail. so is it only ok to have this after you've reached the owl phase? thanks! Hood is a real life saver. I love milk and being able to drink it is almost like having your cake and eating it too!